Users obtain a domain name to establish a unique identity on the Internet. Domain names are not only used to serve names and addresses of computers and services but also to store security controls, such as SPF or CAA records. Many of the Internet protocols were designed at a time where built-in security was not a requirement. The IETF continues to standardize protocol extensions to address today’s security needs. For some protocols security is added with controls stored in your domain names zone file. In order to have the desired effect, the pre-condition is of course that your domain name is secure. In other words, the security of your application that makes use of controls in DNS is only as secure as the security of your domain name. Hijacking a domain name because of weak credentials at the registrar may get the job done but this is far from stealthy and will likely not last long. In many cases it is sufficient to hijack an abandoned subdomain. Taking over abandoned subdomains may be unnoticed by the owner for a very long period of time making it also very useful for targeted attacks. 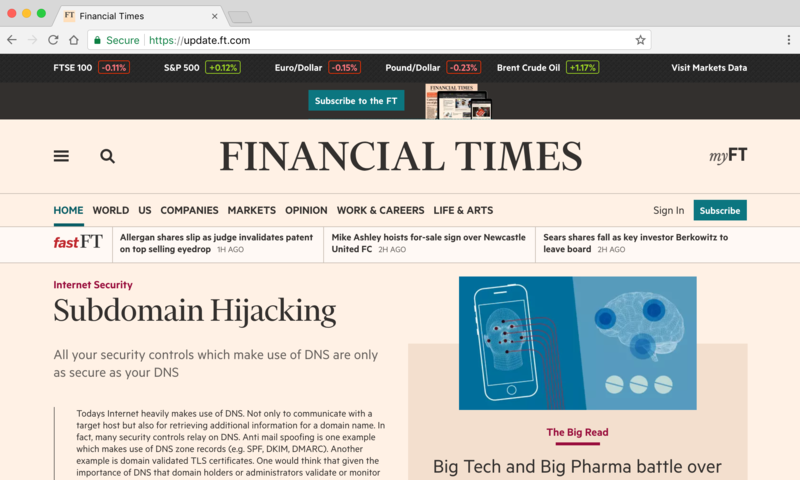 Picture 1: update.ft.com has been hijacked and the content from the ft.com front page is mirrored with a fake article about subdomain hijacking. Note: the website is not online anymore, Financial Times has been notified to remove the abandoned record from their zone file. A Certificate Transparency (CT) log proves that a TLS certificate has been issued for this demo site. Categories: Attacks, DNS & DNSSEC, Espionage, News | Tags: CAA, DMARC, DNS, Domain Hijacking, SPF | Permalink. If you run your own mail server, you will quickly find out that 90% of the e-mails you receive are spam. The solution to this problem is e-mail filtering, which rejects or deletes unwanted spam. This solution is generally well accepted, and most users would not want the old days back when your inbox was filled with scams. Those people who want spam can also work around it by disabling spam filtering for their e-mail address or opting to run their own mail server. Spam, scammers and other malicious abuse are not unique to e-mail. One possible approach is to invent a filtering technology for every protocol or service and allow the service owners to block misuse according to their policy. On the other hand, most services on the Internet make use of the Domain Name System (DNS). If you control DNS name resolution for your organisation, you can filter out the bad stuff the same way you filter out spam on e-mail. 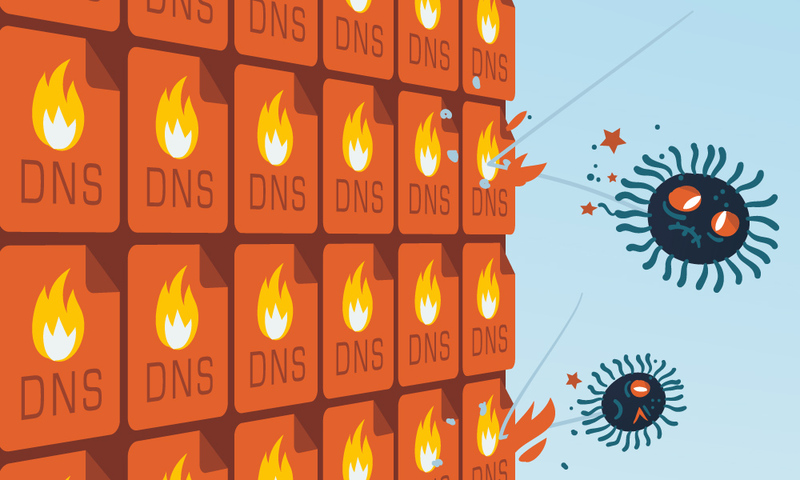 The difference and the advantage of DNS is that DNS filtering is independent of the service you use. Back in 2010, ISC and Paul Vixie invented a technology called Response Policy Zones (RPZ) (See CircleID Post Taking back the DNS). While it has always been possible to block certain domain names from being resolved on your DNS resolver, adding host names manually as an authoritative zone does not scale. Categories: DNS & DNSSEC, Malware, Phishing | Tags: DGA, DNS, DNS Firewall, Malware, Phishing, RPZ | Permalink. Update Nov 2017: DNSSEC zone signing as described here is outdated. We strongly recommend against the method described in this blog post. Newer BIND versions or other DNS software have greatly simplified DNSSEC signing. With BIND 9.9, ISC introduced a new inline signing option for BIND 9. In earlier versions of BIND, you had to use the dnssec-signzone utility to sign your zone. With inline signing, however, BIND refreshes your signatures automatically, while you can still work on the unsigned zone file to make your changes. This blog post explains how you can set up your zone with BIND inline signing. The zone we are using is called example.com. In addition, we look at how to roll over your keys. In our example, we do a Zone Signing Key (ZSK) rollover. We expect that you are already familiar with ISC BIND and have a basic understanding of DNSSEC. More specifically, you should be able to set up an authoritative-only name server and have read up on DNSSEC and maybe used some of its functions already. Before we set up inline signing with BIND, let us look at a typical network architecture. We will set up inline signing on a hidden master name server. This server is only reachable from the Internet via one or more publicly reachable secondary name servers. We will only cover the configuration of the hidden master as the secondary name server configuration will not differ for the signed zone (assuming you are using DNSSEC-capable name server software). Categories: DNS & DNSSEC | Tags: BIND, DNS, DNSSEC, Key Rollover | Permalink.